Professor Lee discusses the findings of his study. 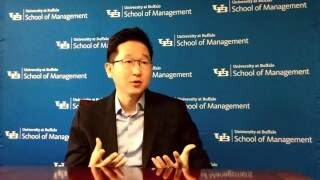 BUFFALO, N.Y. — When employees are undermined at work they begin to undermine their colleagues—causing a vicious cycle, according to new research from the University at Buffalo School of Management. Forthcoming in the Journal of Applied Psychology, the study advises organizations to develop workplace ethics training programs and hire employees who value morality to limit the cycle of undermining. Managers can also emphasize moral values at work by displaying posters or slogans with such values. The researchers surveyed 182 employees at 25 branches of two Korean banks. They conducted two rounds of surveys to measure whether those who had been the victim of undermining would later become a perpetrator. The first survey measured employee’s levels of undermining victimization, moral identity, interpersonal justice and also included control variables. The second survey, conducted one month later, measured employee’s levels of moral disengagement, resource depletion and engaging in social undermining. The study found that as victims feel they’ve been treated disrespectfully and unfairly, they feel entitled to be selfish toward co-workers. Lee collaborated on the project with Eugene Kim, assistant professor of organizational behavior, Georgia Institute of Technology Scheller College of Business; Devasheesh Bhave, assistant professor of organizational behavior and human resources, Singapore Management University; and Michelle Duffy, Board of Overseers Professor of Work and Organizations, University of Minnesota Carlson School of Management.